Please note: The PEAK 2 PEAK Gondola closes for a brief period each year for scheduled maintenance. This usually occurs in spring (late April through to late May) and in fall (early October through to late November). Be sure to check operating times and hours prior to your arrival as exact dates vary from season to season. 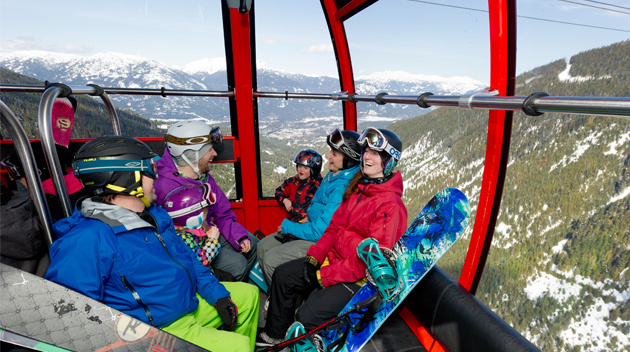 Spring Sightseeing is available up to the Roundhouse only via the Whistler Village Gondola. The PEAK 2 PEAK Gondola is closed during this period. 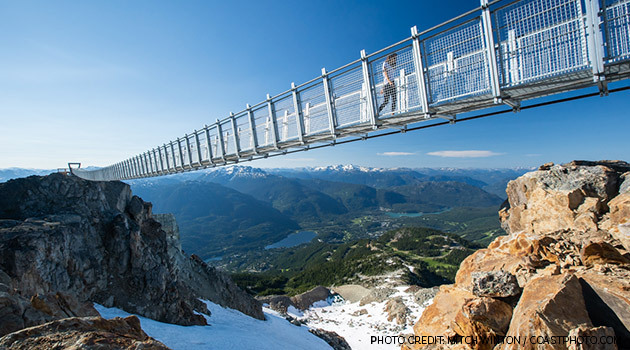 The Cloudraker Skybridge and Ravens Eye Cliff Walk on Whistler Peak are new experiences that were added to the PEAK 2 PEAK 360 Experience in summer 2018. 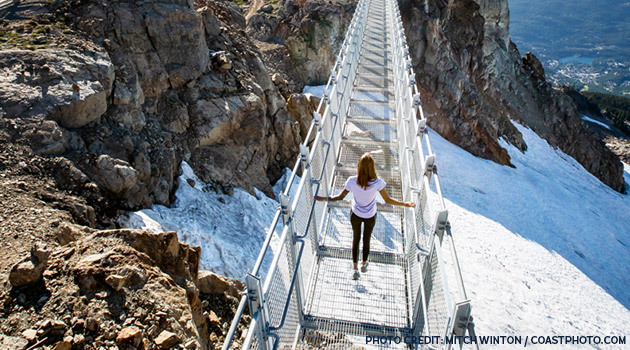 The 130-metre suspension bridge spans from Whistler Peak to the West Ridge over Whistler Bowl. 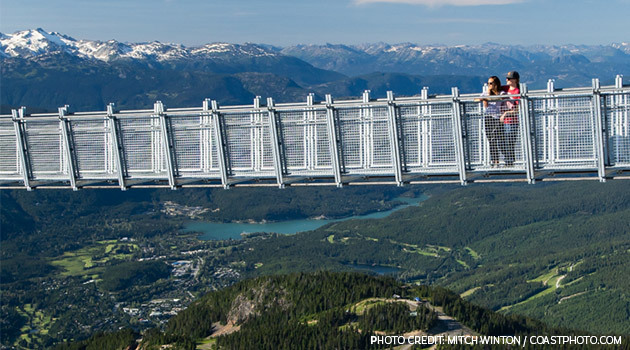 The Raven's Eye Cliff Walk is a viewing platform with 360-degree views from Whistler Peak. PEAK 2 PEAK tickets can only be booked online 3+ days in advance. To book PEAK 2 PEAK Tickets within 3 days of sightseeing, please visit our team at the Whistler Visitor Centre or purchase through Whistler Blackcomb Guest Relations. 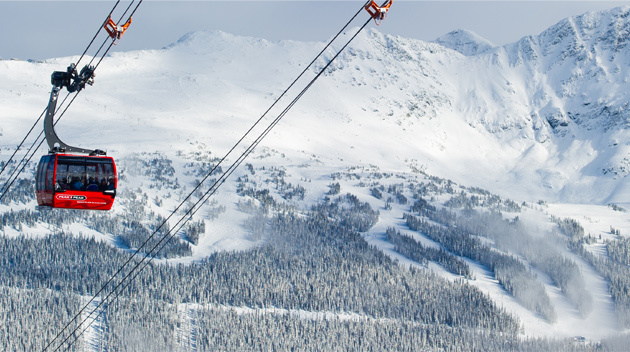 Travel back millions of years to the formation of Whistler and Blackcomb mountains breathtaking alpine environments. Let experienced guides take you on a tour of Whistlers key geological milestones, as well as highlight the flora, fauna, and effects of climate change along the way. 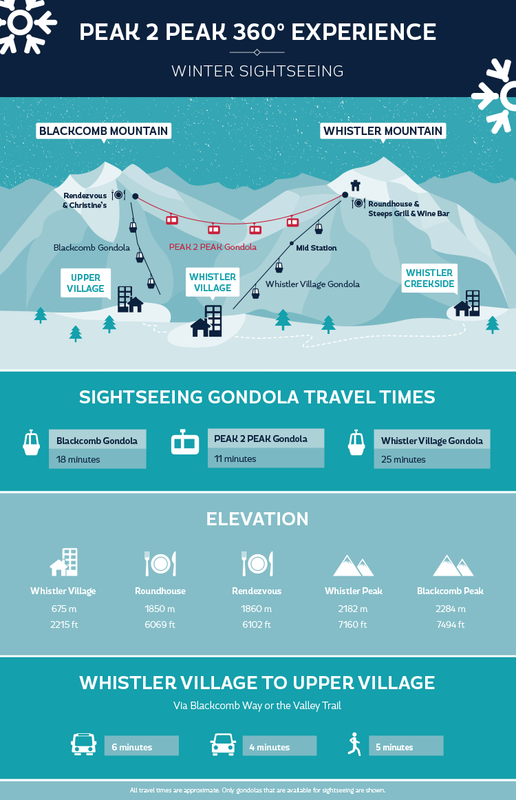 What is the PEAK 2 PEAK Gondola? Building the PEAK 2 PEAK Gondola was a major feat of engineering. On completion, the lift broke world records as the longest, continuous lift system on the globe and the highest gondola of its kind, at 436 metres above the valley floor. 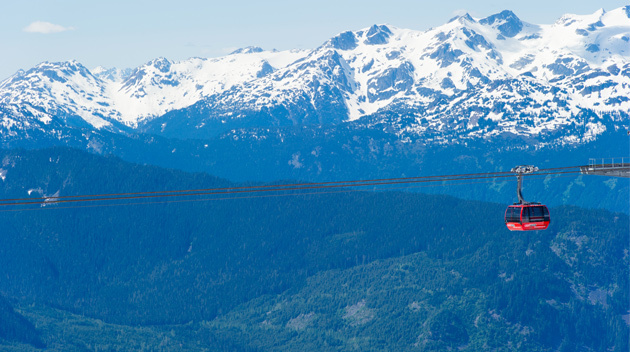 When combined with a ride on the Whistler Village Gondola and new Blackcomb Gondola, it creates a continuous 13.5-kilometre loop from the bottom of Whistler Mountain, across the valley between both mountains, and down Blackcomb Mountain. What is the PEAK 2 PEAK 360 Experience? Sightseeing on the PEAK 2 PEAK Gondola is a must do while in Whistler. A PEAK 2 PEAK Alpine Experience ticket allows you to visit Whistler and Blackcomb Mountains in one day, on the way receiving a birds eye view of the forest and spectacular mountains, valleys and glaciers. A special silver glass-bottom gondola provides another unique perspective of the forest. The 360 Experience is more than just spectacular views. Once on the mountain top there are other things to do: enjoy the PEAK 2 PEAK Viewing Gallery and the Samsung Alpine Theatre, casual and full service on-mountain dining and in summer, mountain-top dining and alpine hiking trails. Is the PEAK 2 PEAK Gondola open year round? While the PEAK 2 PEAK Gondola is open most of the year for winter and summer sightseeing, it closes for a brief period each year for scheduled maintenance. This scheduled maintenance usually occurs in spring (late April through to late May) and in fall (early October to late November). Be sure to check the operating times and hours when planning your visit as exact dates vary from season to season. Where do I park for the PEAK 2 PEAK Gondola? You have two options. 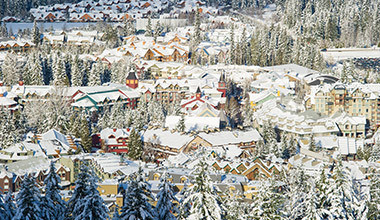 The best place to park to access the PEAK 2 PEAK Gondola is in the Whistler Village Day Lots 1 – 5, located a 5-10 minute walk from the base of Whistler Mountain. Learn more about parking in Whistler. Why am I unable to book PEAK 2 PEAK Gondola tickets online for today? Have tickets sold out? No, tickets have not sold out. 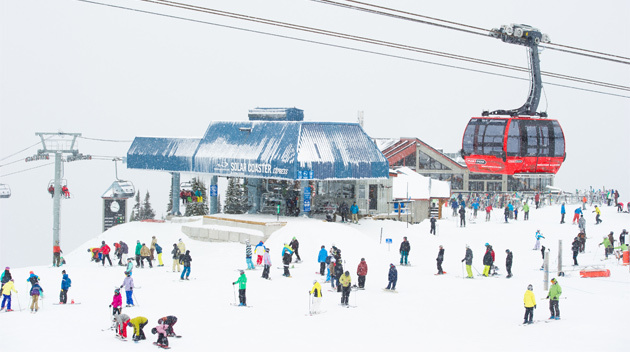 Due to processing times, PEAK 2 PEAK tickets can only be booked online 3+ days in advance. To book PEAK 2 PEAK Tickets within 3 days of sightseeing, please visit our team at the Whistler Visitor Centre or purchase through Whistler Blackcomb Guest Relations. Do I need to reserve a boarding time for the PEAK 2 PEAK Gondola? No. There are no reservations required for the PEAK 2 PEAK Gondola as it runs continuously during operating hours. There is also no limit to the number of PEAK 2 PEAK 360 tickets sold on a particular day. How do I access the PEAK 2 PEAK Gondola? 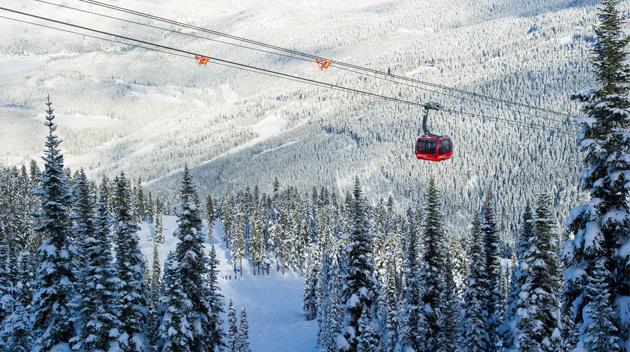 The PEAK 2 PEAK Gondola runs between Whistler and Blackcomb Mountains with terminals approximately two-thirds up the mountains. 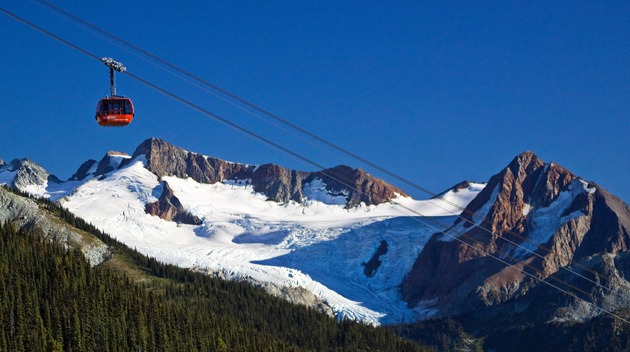 Access to the PEAK 2 PEAK Gondola is via the Whistler Village Gondola or the Blackcomb Gondola. Note that the access points change with the seasons. Please check operating times and hours before heading out. 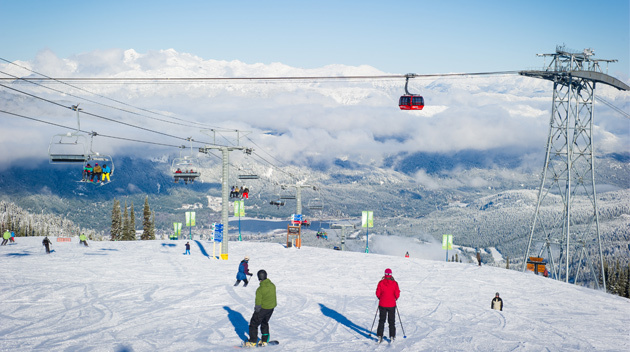 Your PEAK 2 PEAK 360 ticket includes access to the Whistler Village Gondola or Blackcomb Gondola for upload, any operating open-air chairlifts and the PEAK 2 PEAK Gondola. You do not need to purchase separate passes for each. 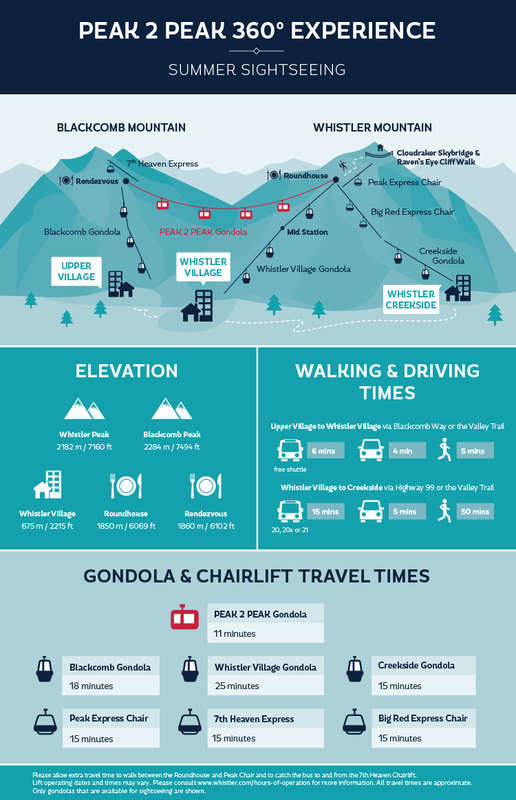 How long does it take to ride the PEAK 2 PEAK Gondola? It is recommended that you give yourself at least 2 hours to ride the PEAK 2 PEAK Gondola and return to the Village. 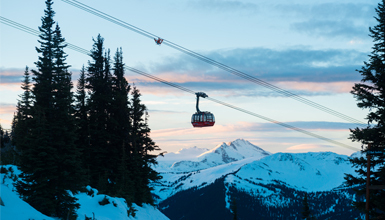 It takes approximately 25 minutes to ride the Whistler Gondola/open-air chairlifts up to the PEAK 2 PEAK, 11 minutes to ride the PEAK 2 PEAK each way (22 minutes round trip) and 25 minutes to return to the Village. If you are interested in dining, taking lots of photographs, going on a hike or viewing the gallery while on the mountains, be sure to give yourself more time - you can easily spend an entire day up among the peaks! Several days are needed to explore all the hiking trails in summer. Is there anywhere to eat on the mountains? Yes - each mountain has several restaurants for casual and full-service dining. 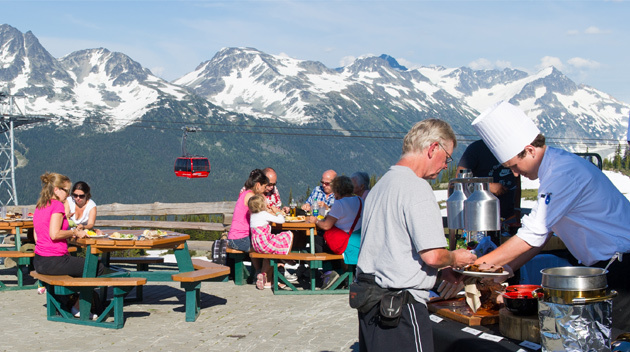 View Whistler Mountain and Blackcomb Mountain dining options. Friday, Saturday and Sundays during summer the Mountain Top Summer Feast is a unique dining experience which can be added to the lift tickets. What is the best time of year to ride the PEAK 2 PEAK Gondola? No matter what season you visit Whistler, the alpine is an incredible place to visit. Depending on the season you may see fresh and falling snow, alpine wildflowers and wildlife including bears, chipmunks, deer and marmots. You can also watch skiers, snowboarders and mountain bikers ride the mountains from the comfort of the cabin. Be sure to check the operating times and hours when planning your visit as these vary from season to season, and note the times when the gondola does close briefly for scheduled maintenance. In summer, hiking trails open in stages as the snow melts - opening dates may vary according to the snow pack and weather conditions. What is the PEAK 2 PEAK Viewing Gallery? Years were spent of planning and constructing the PEAK 2 PEAK Gondola with its signature red gondolas. Learn more about the ground-breaking engineering behind the lift in the PEAK 2 PEAK Viewing Gallery inside the terminal on Whistler Mountain. A raised glassed-in walkway enables visitors to view the machinery working and tablets show videos exploring the construction of the lift and Whistlers ski history. The Viewing Gallery allows visitors to appreciate the true scale of the project, adding a whole new dimension to the Alpine Experience. Will I need to wait in line? Wait times for the PEAK 2 PEAK Gondola vary and lines are usually longer on weekends and during holiday periods. Please allow yourself extra time to board the gondola. Can I take my dog on the mountain? Dogs are not permitted on Gondolas or any Whistler Blackcomb property, unless they are certified aid dogs or CARDA (Canadian Avalanche Rescue Dogs). There are however plenty of dog-friendly accommodations and activities in Whistler. See our pet-friendly Whistler guide for further information. I have my tickets! What should I take with me? As you are going from Whistler Village in the valley to the PEAK 2 PEAK Gondola in the alpine, weather conditions and temperatures can change. As a rule of thumb it is usually 5 to 10 degrees (Celcius) cooler on the mountain than in the village. Dress comfortably for the mountains - layers are recommended so you can adjust accordingly. If you plan to hike, other gear is recommended such as comfortable, sturdy shoes and water. Please note that to access the PEAK 2 PEAK Gondola in winter time, you will need to walk through the snow - dress warmly and wear waterproof boots for comfort. There are restaurants, shops and washroom facilities on both mountains. Thinking of riding the PEAK 2 PEAK Gondola? We’ve got the ultimate guide to sightseeing on Whistler and Blackcomb Mountains, with insider tips. 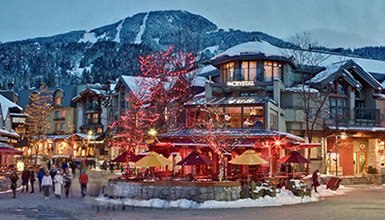 Choose from a wide range of privately owned and managed condos, homes and apartments for your next Whistler Vacation. Valid for winter stays. Rate subject to availability.